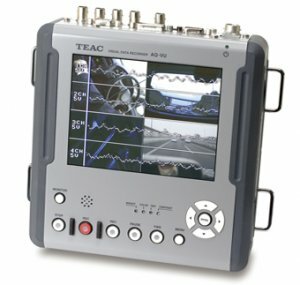 The TEAC AQ-VU is capable of synchronously recording up to 4 channels of video camera data and up to 4 channels of analog data. The recorded video and analog data are stored in the HDD pack and they can be synchronously played back. The video is recorded as fast as 60 frames per second per channel in Motion-JPEG for smooth high resolution. The number of recording channels in both video and analog can be freely selected based on application needs. The event outbreak time can be easily managed. The accessory viewer software allows play-back of the recorded video and analog data synchronously on PC or the video and analog data is easy to verify without a PC using the built-in LCD monitor. It can record a video with various synchronized measurement data using LX-100 series.